Click here to view our leather options. Click here to order leather-vinyl match swatches. Leather-Vinyl Match fabrics are a cost effective way to have leather furniture without the cost of fully leathering it. A Chair with a Leather-Vinyl Match fabric set uses leather on all parts of the chair that you touch and a matching vinyl on the parts that you don't, usually on the sides and back of the chair. Power recliners put relaxation at your fingertips. At the push of a button, you can recline to an infinite number of positions with one of the smoothest and fastest recline speeds in the industry. Power recliners provide an infinite number of comfortable positions. Hand-assembled hardwood frames and reliable power mechanisms deliver years of solid, smooth operation. Traditional power recliners, transitional power recliners and contemporary power recliners - available in hundreds of fabric and leather selections - make home decoration just as easy. The Wallhugger design means the chair will recline outward away from the wall. The recliner will not rock it will only recline. Leather-Vinyl Match fabrics are a cost effective way to have leather furniture without the cost of fully leathering it. A Chair with a Leather-Vinyl Match fabric set uses leather on all parts of the chair that you touch and a matching vinyl on the parts that you don't, usually on the sides and back of the chair. Power recliners put relaxation at your fingertips. At the push of a button, you can recline to an infinite number of positions with one of the smoothest and fastest recline speeds in the industry. 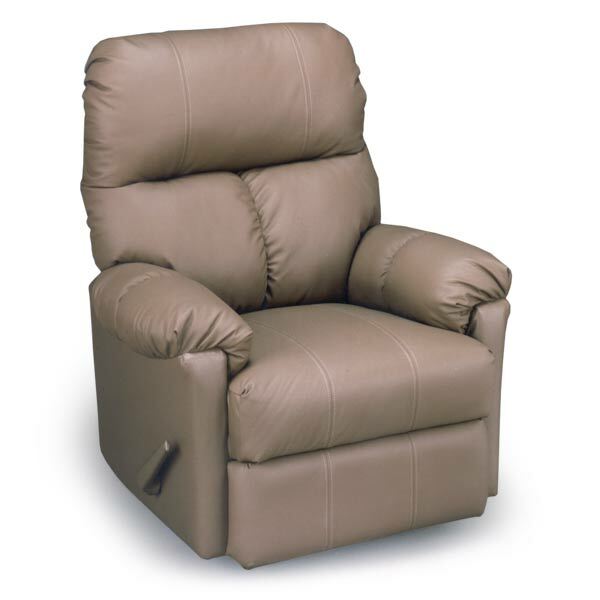 Power recliners provide an infinite number of comfortable positions. Hand-assembled hardwood frames and reliable power mechanisms deliver years of solid, smooth operation. Traditional power recliners, transitional power recliners and contemporary power recliners - available in hundreds of fabric and leather selections - make home decoration just as easy. The Wallhugger design means the chair will recline outward away from the wall. The recliner will not rock it will only recline. This lift recliner has a weight limitation of 250 lbs. High Density Cushioning Foam/High-Loft Premium Polyester Cushioning. One of the plushest, most comfortable seats in the industry. Doweled, Corner Blacked, Glued and Screwed. Multiple processes, sometimes including truss plates where needed to ensure long lasting joints. Superior Seat Spring Construction. Sinuous wire springs are cross-wired to prevent sagging. Spring clips are coated with polypropylene to prevent squeaks. Our chairs feature hardwood frame construction. Special attention is added at each step of construction and every chair is individually upholstered by an experienced craftsman. Chair Height: 39 inches. Chair Width: 33.5 inches. Chair Depth: 36.5 inches. Seat Height: 19 inches. Seat Width: 16.5 inches. Seat Depth: 20 inches.